Figure 1: a schematic of the observational measurement. The light from the distant QSO (quasar) passes near to a galaxy and interacts with its associated gas. 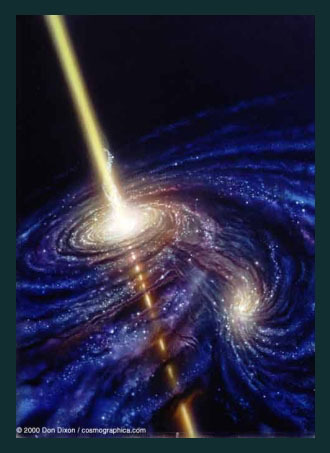 The absorption is dependent on many things: the position of the gas along the line of sight (LOS), the distance from the galaxy (Transverse Distance, TD), whether it’s infalling or outflowing, and even its rotation. For galaxies, gas is a pretty big deal. Without it, they’re unable to form new stars — which is pretty much their only job. Once they get hold of some though, stars of all shapes and sizes start forming. Some of these will be massive, rapidly burning up their fuel and going supernovae. If the supernovae is energetic enough, this can eject a load of precious gas and shut down the star formation again. Understanding this precarious galactic balancing act, between inflows and outflows of gas, is crucial for modelling the properties of galaxies. One way of picking apart this relationship is to look at where the inflows and outflows of gas meet. This area is approximately a few megaparsecs outside the galaxy, roughly 8 times the distance from the center of the galaxy as the edge of the disc of the Milky Way, and is known as the CircumGalactic Medium, or CGM. The gas in these regions doesn’t shine brightly of itself, so we have to infer its presence through other sources of light. One method takes advantage of Quasi-Stellar Objects (QSOs or quasars for short) behind the galaxy: as the light from a quasar passes through the CGM it gets absorbed by neutral hydrogen and metals (astronomer speak for any element heavier than helium) in the gas, and we can see this in its spectrum (see Figure 1). The pattern of absorption can tell us what metals are in the gas, and, importantly for this work, its direction of flow with respect to the galaxy. Today’s paper uses observations from the Keck Baryonic Structure Survey (KBSS), which studies the gas around 854 star forming galaxies at a redshift of two (around 3 billion years after the big bang) using background quasars. The authors compare the observations with mock spectra from the EAGLE simulation, a computer model of galaxy formation and evolution that matches various galaxy properties. The mock spectra are designed to mimic KBSS as closely as possible, so that comparisons can be made between the two. For this study they measure the optical depth (which roughly corresponds to the amount) of three elements: neutral hydrogen, ionised carbon and ionised silicon. Figure 2 shows two dimensional maps of these elements in both KBSS and the simulations – they look pretty similar! 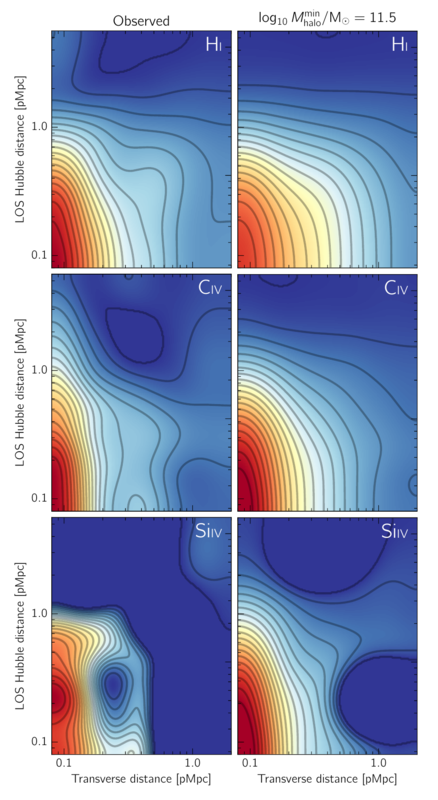 Figure 2: 2D maps of the amount of neutral hydrogen (HI), ionised carbon (CIV) and ionised silicon (SiIV) surrounding galaxies. The left column shows the observations, the right column shows the best fitting simulated galaxies. The bottom left corner of each panel corresponds to the position of the galaxy, and the x and y axes represent the transverse / line of sight distance from the galaxy, respectively. Unfortunately, these measurements can get messy. 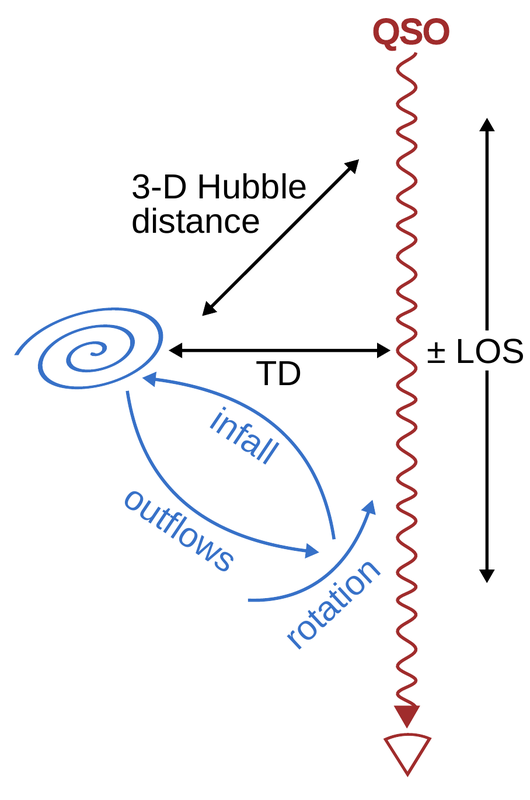 Not only can the gas be inflowing or outflowing, but also rotating around the galaxy (see Figure 1). The host galaxy can also be moving with respect to the gas. All of this introduces uncertainties in the measured positions and velocities of the galaxy and its gas. The authors attempt to disentangle all of these effects, and find that the uncertainties on measurements of the galaxy distance (its redshift) have little effect: it’s the velocity of the gas that is important. They then try to pick apart its direction. In a simulation you know the motion of the gas directly, rather than having to infer it from a spectrum. The authors find that in EAGLE most of the gas is infalling, and since the mock spectra in the simulation are similar to the observations, the authors tentatively suggest that the gas in the observations could also be infalling. They also find that the more massive the dark matter halo hosting the galaxy, the higher the rate of infall. The optical depth is also insensitive to the amount of ‘feedback’ from supernovae in the simulation, supporting evidence for the idea that the higher observed gas densities are due to infalling, rather than outflowing, gas. Today’s paper is a classic example of how simulations can help us understand our observations of the universe. By unpicking subtle features in the light of distant objects, which by chance happen to align with a galaxy, we can reveal the complicated relationships between galaxies and their surrounding gas. The authors also note that future studies of even greater detail could pick out other elements in the spectrum, such as Oxygen. These results are another step toward the ultimate goal of building a comprehensive model of galaxy evolution.